The College of Westchester was the 2015 recipient of the prestigious Quality Matters (QM) “Making a Difference for Students” Award in the Institution Category for online excellence in teaching, training, online observation, and online pedagogy and andragogy. CW continues use the QM rubric to create all our online and hybrid courses. All CW subject matter experts and anyone teaching these courses must complete CW’s online training module. Accepting the award on behalf of The College of Westchester was Paula Cancro, Assistant Professor and Assistant Chairperson. The award was presented at the 7th Annual Quality Matters Conference. The QM Awards recognize individual and institutional efforts exemplifying QM’s focus on learners. Awardees demonstrate a commitment to ensuring high course quality and using different but valuable approaches to improving learner outcomes. The College of Westchester was recognized for implementing QM Standards as part of a robust course improvement program to provide quality online courses for all students. Deb Adair, Ph.D., Managing Director and Chief Planning Officer of Quality Matters remarked, “The awards committee reviewed many impressive nominations this year, and your selection for this award demonstrates the significance of your achievements. We applaud your efforts to make a difference for students." “The College of Westchester is delighted to be receiving this prestigious award. Since the development of our programs and coursework, and launch of our Online Division in 2011, one of the very first essential building blocks was the rich training and resources that QM provides. 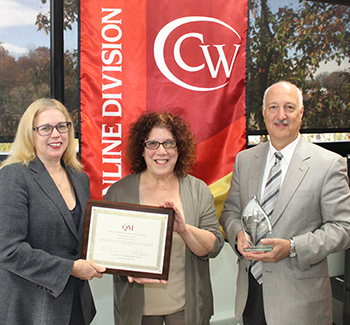 It is especially gratifying to be honored by an organization that we hold in such high esteem, the gold standard for online education development,” said Mary Beth Del Balzo, CW’s President and CEO. Quality Matters (QM) is an international organization that provides the tools and professional development for quality assurance in online learning. QM subscribers include community and technical colleges, colleges and universities, K-12 schools and systems, government agencies, corporations, and other education-related organizations.